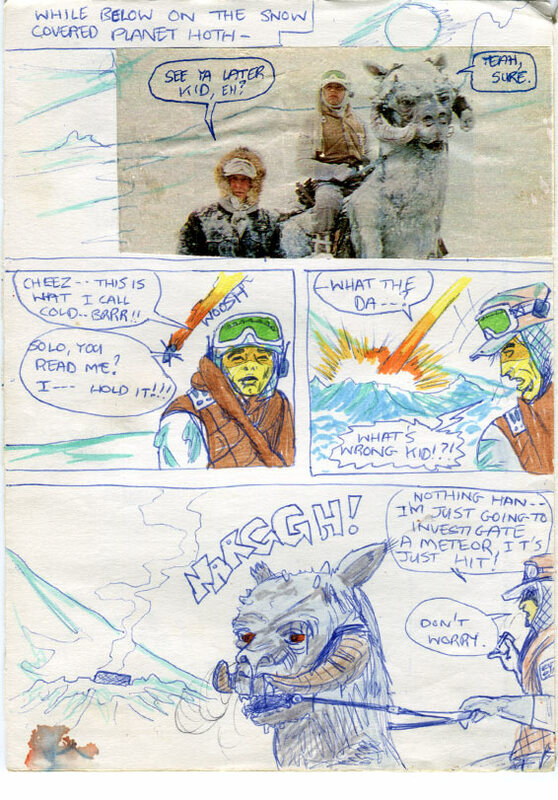 This comic has begun with the Imperial Star Destroyer above the planet Hoth, lauching probes, as I think the movie does. But neither the Marvel comic adaptation, the ‘Storybook’, nor the novelisation do. Which leads me to believe that I saw the film, then started this comic of my own before I saw those other adaptations. Thing is though, this artwork looks a bit too advanced for a 12 year old! Still vibrant colour after over 35 years! Was I really this good when I was only 12 and a half years old? 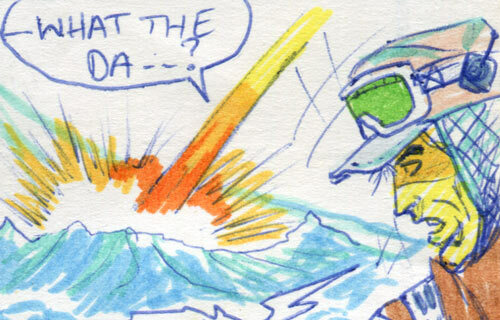 So was this a a repeat of what I did on the ‘Star Wars’ adaptation three years before? I.e., See the film and then make a comic of it before having anything tangible but newspaper and magazine clippings to refer to. It seems possible, which really surprises me. I always thought that I knew the story before seeing the film. But as I turn it over in my head, I seem to recall that my friend John S and I bought our copies of the novelisations in McGuire’s newsagent in Ballymore Eustace village during the summer. I’m pretty sure I was reading in near darkness in bed, with the curtains drawn, as my dad was outside mowing the lawn. So that’d be summer 1980, and then the long wait until December–probably–to see the film; or summer 1981 after we’d seen the film. That UK publisher ‘Sphere’ books copy of the novelisation which I still have (over 35 years later!) was published in 1980, but maybe it wasn’t sold in Ireland for another year? Hmmm. Maybe as we go along we’ll figure it out. If you look at this page, there really isn’t much–or any–of the dialogue from the movie or those other adaptations. Later in this comic, you will see the direct influence of Al Williamson’s brilliant artwork for the Marvel version though. I’d love to read your comments below. What were the first images that you saw from The Empire Strikes Back? Tell us all about it. On the planet Hoth, we see Han Solo and Luke Skywalker and a tauntaun. Han: "See you later kid, eh?" Luke: "Cheez, this is what i call cold. Brrr..."
(Whoooosh!) Something falls form the sky in flames. "Solo, you read me? I... hold it!" The missile strikes the snow. Solo (on the comlink): "What's wrong kid?!?" Luke" Nothing Han. I'm just going to investigate a meteor. It's just hit. Don't worry." I read the novel before seeing the movie too! Not too worried about movie spoilers back then, I guess. One of my older brothers read the book before I did and spoiled the Vader dad thing, which sucked. No, we weren’t worried at all, Phil. Did we still love the ‘spoiled’ films because we were kids who were easily pleased once we got what we wanted (beloved characters, spaceships, laser guns…) or was it such a great film that it couldn’t fail to thrill and amuse? I think we wanted to know EVERYTHING before going to it. Yes, the desperation to avoid spoilers is quite a modern phenomenon. Nowadays, when a new Star Wars film comes out, I avoid social media for days beforehand. But back then, I devoured any information, spoilers included. I’ve been thinking of doing a post about that very subject over at my blog Episode Nothing. Some great drawing here, John. It’ll be interesting to see whether you work out when it was done and what reference material you had. My memories of seeing Empire aren’t quite as clear as seeing Star Wars, for some reason. I get the impression that might be the case for you too. It’s funny, I’ve been avoiding reading about movies I’m looking forward to for many years. I read very little about Prometheus before it hit, but I read and saw enough speculation to get a quite different idea of what the film would be like. I still loved it, but many many other people—especially ALIEN fans—didn’t. A similar thing is happening with Star Wars movies now. Fans are deciding what should happen in forthcoming films and are often incensed that they didn’t get what they wanted! Having written this, it strikes me that the main problem with foreknowlege and the internet!—is incorrect and unrealistic expectations. I suspect this is worse in the case of Franchises—which most blockbusters seem to be a part of these days. I mean, how on earth are creators meant to present a SW movie which will satisfy everyone?—especially those who have invested so much of their lives in a ‘Saga’. The obvious way to maximise the hit rate is to use focus groups, adhere to what the majority of obsessed entitled and rabid fans are demanding and complaining about online, and create a dense hodge-podge film that tries to fit everything in. Even if that wasn’t impossible, I daresay it’d be a mess.